Green fashion is in and the fashion show to prove it was held at Copenhagen’s Opera House — across the Danish capital from where delegates from 192 countries are gathered to hammer out an agreement aimed at stemming global warning — the display brought together 20 designers from five Nordic countries and representatives of such retailing heavyweights as H&M and Barneys. Designers each presented two looks made from organic cottons and silks, polyesters made from recycled plastic bottles or new fabrics made from waste left over from industry and agriculture. Never heard of Crabion? It’s made from byproducts from the crab industry. And Ingeo? It’s made out of corn scraps and can be made to mimic the smoothness of silk or the glossy sheen of PVC. Ditto, Milkfiber, which, you guessed it, is milled milk: from the powder left over from boiled milk, more precisely. I was searching through Google and came upon an odd and funny search suggestion, I always knew men were notorious for loving their cars but come on. This is not one of those ideas where Coke is going green for St. Patricks Day or anything. 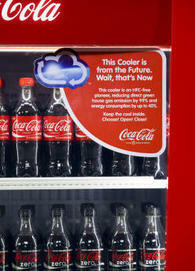 Coca-Cola has pledged it will eliminate a major greenhouse gas in its new vending machines and coolers, raising the bar for climate-friendly refrigeration in the food and beverage industry. Coke’s Chief Executive Muhtar Kent said that the company, which sells everything from soda and juice drinks to water, will replace hydrofluorocarbon, also known as HFC, in its new vending machines and coolers by 2015. While Coke’s 10 million vending machines, coolers and other refrigeration equipment around the world keep its drinks chilled, they also are the biggest contributor to the company’s carbon footprint. To ramp up the transition to greener machines, Coke and its bottling partners will buy 150,000 units of HFC-free equipment in 2010, doubling the company’s current pace for buying the systems. Coke has invested $50 million in research for climate friendly replacements. The company expects the move to greener equipment to cut its emissions by nearly 53 million metric tons–the equivalent of taking 11 million cars off the road for a year–over the 10-year life-span of the equipment. It seems carbon emissions reductions in large corporations is continuing to proliferate, which is great news! Interesting video on destruction of a ambulance at a Japanese Auto Wrecker, they don’t crush it, just sort of rip it apart like Godzilla? After dreaming of owning a Honda Skydeck I thought this look back at concept cars of the past would be fun!